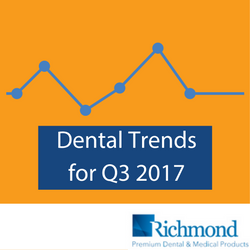 Throughout the year we try to keep our readers up-to-date on trends within the dental and medical products industry. A lot happened over the summer, so here are three trends or news items that caught our attention. 181 million Americans don’t visit the dentist—though half of the adult population over 30 has some form of gum disease. 25% of children under the age of five have cavities. Over $2.1 billion in dental-related emergency room visits occurred in 2010. Needless to say, H.R. 2422 has the potential to positively impact many Americans. How Much Is a New Patient Worth to a Dental Practice? These numbers were calculated from a ratio of average gross production to unique patients receiving comprehensive exams in the six months prior to the most current month. The DentistryIQ article’s analysis of these numbers says the potential lies in keeping these new patients, and that the best way to do so is through communicating with the patient before, during, and after an office visit. So, do Americans have healthier teeth all of a sudden? With sugar consumption on the rise in the U.S. population, that’s doubtful. The article suggests that “a more likely explanation is that dentists are becoming less effective at presenting the need for a crown, especially in situations where the tooth is asymptomatic.” Ultimately, if dentists are willing to hone their case presentation skills, these numbers could change dramatically.